This product requires the base game Knights of Pen & Paper 2. The latest expansion for Knights of Pen and Paper 2, Here Be Dragons, takes your heroes to the kingdom of Expandria! Meet the Expandria Royalty and their court, go to knight school to become a... Knight! Travel across land, sea, air – fight your way through caves and on occasion mud in an epic quest! Stop smugglers, face witches & pugbears, and slay dragons in order to save the day and get shiny loot. If all this becomes too much to handle - you can help the King with his crosswords instead. All-new high-level campaign with Increased skill cap! New side quests, locations, crafting recipes etc and so forth. Dragon fights and a Mad King! © 2016 Paradox Interactive™. Trademarks belong to their respective owners. All rights reserved. 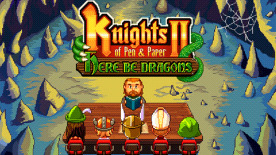 Knights of Pen and Paper 2 is required to play this DLC.